Sharon Ashwood is a novelist, desk jockey and enthusiast for the weird and spooky. She has an English literature degree but works as a finance geek. Interests include growing her to-be-read pile and playing with the toy graveyard on her desk. As a vegetarian, she freely admits the whole vampire/werewolf lifestyle would never work out, so she writes her adventures instead. 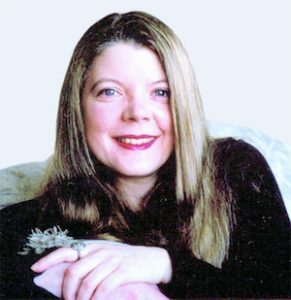 Sharon is the winner of the RITA® Award for Paranormal Romance. She lives in the Pacific Northwest and is owned by the Demon Lord of Kitty Badness. Deadlines? Housework? Seriously, inspiration can come from anywhere. Often for me it begins with a mood created by a picture or visiting a place. That atmosphere and emotion will hijack my brain and off I go. I don’t get back to my real life until I’ve somehow resolved the way it made me feel. Some days I feel like a high-functioning imposter, because I go about my daily routine while my true self is in another reality. I outline, but I give myself permission to explore around the edges. The best ideas come from a slower, organic process. However, if I need to complete a draft quickly, I’ll do more restrictive plotting. Typically I begin with a large piece of brown newsprint tacked to the wall and a stack of post its. I’ll just start adding everything I know about the story on the post its and begin arranging them until a sequence emerges. Then, once I feel the story has gelled, I’ll transfer the information into Scrivener, which is software designed for writing. I don’t do a lot of pre-writing exercises, but I do gather a fair amount of research material about subjects I’m less familiar with. Given what I write, that can be everything from how to pick handcuffs to nineteenth-century grave robbing to menus from ancient Rome. My characters walk into my head full-grown, with names and personalities intact. It does take time to get to know them, but I always feel they’re telling me who they are rather than the other way around. Take your time and give yourself as much opportunity as you need to find your voice as an author. I think in a very crowded marketplace, reputation for quality is hugely important, whatever genre you write in. When I began as an author, self-publishing wasn’t around as much. So far I've been trad and I’m just getting into indie now because I feel it offers important flexibility. Plus, as a professional I need to know about this part of the industry. I want the best of both worlds going forward. The one thing I know is that there will be stories. Culturally, we’re wired to explore ideas through tale-telling, whether through the written word, oral tradition, or as drama. As for how these are delivered, I’m sincerely hoping for a diverse marketplace with a lot of different sales channels. The more options there are in terms of print, ebook, indie, big box, online, small press, independent booksellers, and so forth—well, maximum variety serves authors and readers. There’s room for everyone. What genres do you write? : Paranormal romance, urban fantasy, steampunk, historical.